I just had the opportunity to review the most recent release, Hold On, from Kirk Fletcher and it's quite good. 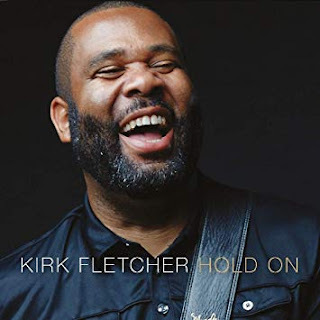 Opening with R&B style track, Two Steps Forward, Fletcher shows his power as both a soulful lead singer and excellent lead guitar player. His guitar style is warm like cray, fluid like Clapton and funky like Hendrix but all original. Super opener. Sad Sad Way has a Jimmy Reed style with plenty of enthusiasm, hot guitar riffs, and super backing by Matt Brown on drums and Jonny Henderson on keys. One of my favorite tracks on the release is soulful ballad, The Answer with warm, rich guitar accompaniment over a soft bed of organ and Fletcher's solid vocals. Fletcher really knows how to milk the blues from his guitar and this track is an excellent example of his chops. Really nice. Time's Ticking is a great slower blues/rock number with clever drumming which, with organ tension sets a terrific stage for Fletcher to unleash the fury...and unleash he does. Terrific! Dupree is a super jazzy/blues track in the manner of JG Watson or WW Washington. Excellent! Wrapping the release is a terrific soul track, Hold On with beautiful backing vocals by Jade McCrea and an excellent guitar interlude by Fletcher. Excellent closer.